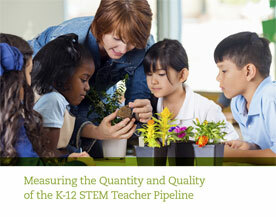 In this paper, Suzanne Wilson, a nationally renowned expert on teacher preparation and professional development, reviews recent efforts to measure aspects of teaching and teachers’ work that are difficult to quantify but that are more closely related to student learning outcomes than the most commonly used proxies for teacher quality. Wilson then describes the range of learning opportunities available to STEM teachers and the data available on the frequency and distribution of those teacher learning opportunities. Teachers’ participation in STEM-specific professional development activities.